It’s the time of year when we seine ponds in search of California Tiger Salamander larvae. We found quite a few last week so I thought this would be a good time to display a few photos of salamanders in different stages of development. In this first photo, the larvae is showing signs of leg muscle development and first signs of diminished dorsal fin. The dorsal fin on this larvae is further reduced, the leg muscles are improving and some yellow spots are appearing near it’s belly. It’s gills appear to be diminished in size. This larvae is further along than the others. Gills are gone, dorsal fin gone and coloration is more like an adult. Assuming they avoid predators, these larvae will leave the pond in the next couple weeks. My good friend and photographer, Joe DiDonato, shared a couple of his bird photos the other day. He gave me permission to post them here. They are nice photos of an ash-throated fly catcher. You can see more of Joe’s work on facebook. Here’s a link. On the way home from the ranch last week. First fawns of the season. There are two of them hiding in the grass to the left of the doe. Eagle and eaglets. There are two eaglets, but they are laying low in the nest, behind the adult. Only their downy white heads stand out. Survival of young animals is often based upon their ability to stay out of sight. 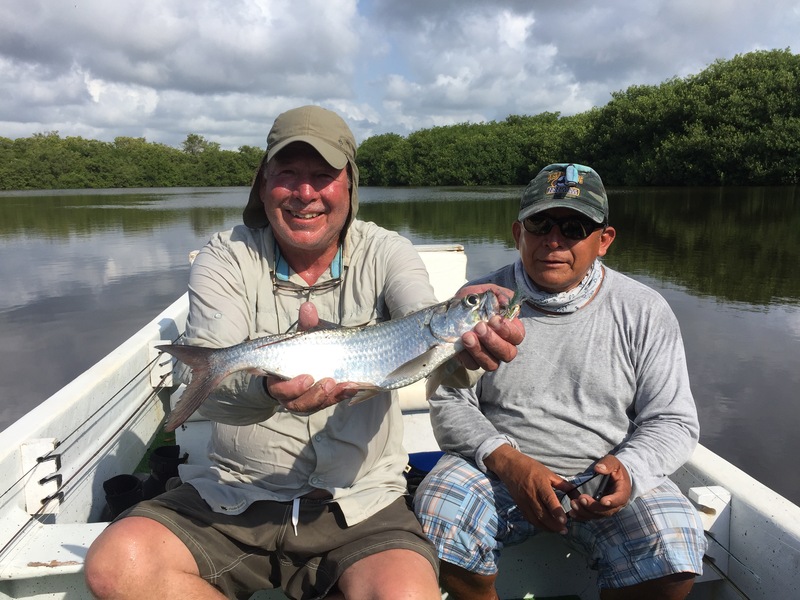 On day four of our trip to Xcalak, our guide, Alberto, suggested that we give tarpon a try. After an exciting boat ride along the reef, we entered an area surrounded by mangroves. While listening to chachalacas (partridge) calling and tarpon splashing, we watched crocodiles swim along the mangroves at the far end of the lagoon. The setting was perfect. Here’s the video I took as Rob cast to active tarpon. After Rob caught his, it was my turn. After several missed opportunities, I too landed a baby tarpon. We followed up with a fruitless attempt at snook, but caught a dozen or so perch and small jacks in the channel that connected the lagoon to the beach head. Later on we made it back to the flats and added a few bonefish, snapper and jack. It was a fun day. In Xcalak, Mexico this week fly fishing. Caught this tapon on the third day. Home tomorrow night. More next week.